Recipe from Sallys Baking Addiction. It was in my "To bake list" more than months. I was so excited trying this Vanilla and Chocolate cupcakes recipe. 1. Preheat oven to 350F degrees. Line muffin pan with 12 cupcake liners and an additional pan with 2 liners. This recipe makes about 14 cupcakes. Set them aside. 2. 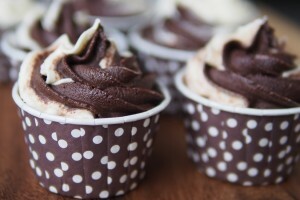 Make the cupcakes: in a medium bowl, mix together flour, baking powder, baking soda, and salt. 3. Set aside. In a large microwave-safe bowl, melt butter in the microwave. Whisk in sugar - mixture will be gritty. Chill in the refrigerator for 1 minute. Stir in egg, yogurt, 3/4 cup milk, and vanilla extract until combined. Slowly mix in dry ingredients until no lumps remain. Batter will be thick. 4. Transfer 3/4 cup of batter to another medium bowl. Mix in cocoa powder and 1 Tablespoon milk until combined. Chocolate batter will be extremely thick. 5. Spoon 1 Tablespoon of vanilla batter into each cupcake liner. Top with a spoonful of chocolate batter, then more vanilla batter on top until all batters have been used up. At this point you may swirl the batters together very lightly using a toothpick or leave them as is, as I explained in the post. Bake the cupcakes for 20-24 minutes or until a toothpick inserted in the center comes out clean. 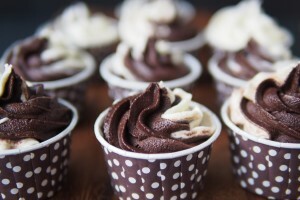 (Bake for 8-9 minutes if making mini cupcakes.) Allow cupcakes to cool completely before frosting. 6. For the chocolate frosting: sift together the confectioners' sugar and cocoa powder to assure there are no lumps. Set aside. With a handheld or stand mixer fitted with a paddle attachment, beat the butter on medium speed until creamy - about 2 minutes. Gradually add the sifted sugar/cocoa powder alternately with the heavy cream and vanilla. Beat on low speed after each addition. Once all added, beat on high speed until creamy and combined for at least 2 minutes. Add a pinch of salt if frosting is too sweet. 7. For the vanilla frosting: With a handheld or stand mixer fitted with a paddle attachment, beat the butter on medium speed until creamy - about 2 minutes. Add confectioners' sugar, cream, and vanilla extract with the mixer running on low. Increase to high speed and beat for 3 full minutes. Add more powdered sugar if frosting is too thin or more cream if frosting is too thick. Add a pinch of salt if frosting is too sweet. 8. Frost cooled cupcakes with a knife or with a piping bag/tip. If you'd like to just make 1 kind of frosting and not both, make sure you double the frosting recipe of your choice to make sure there is enough for all cupcakes. To swirl the two frostings like I did, here is how I made the swirl frosting. There may be leftover frosting depending how much you use on each cupcake. 9. Store cupcakes in an airtight container at room temperature for up to 2 days and in the refrigerator up to 5.